An exhibition ‘Seeding 2015’ in which a new art movement is focused upon, will be held at “Cave Contemporary”. Its aim is to support the artworks created by a new generation, to indulge our feelings so that they represent the dynamism of the natural human mind/the art. 【Site】Dokutsu Gendai (Cave Contemporary) 61-5 Shimokuzawa Chuo-ku Sagamihara-shi, Kanagawa Pref. In May 2014, the first part of the exhibition was held, in which Hanazawa created a personal space for the person’s funeral rites. As it was a kind of pseudo funeral, an audience was invited. 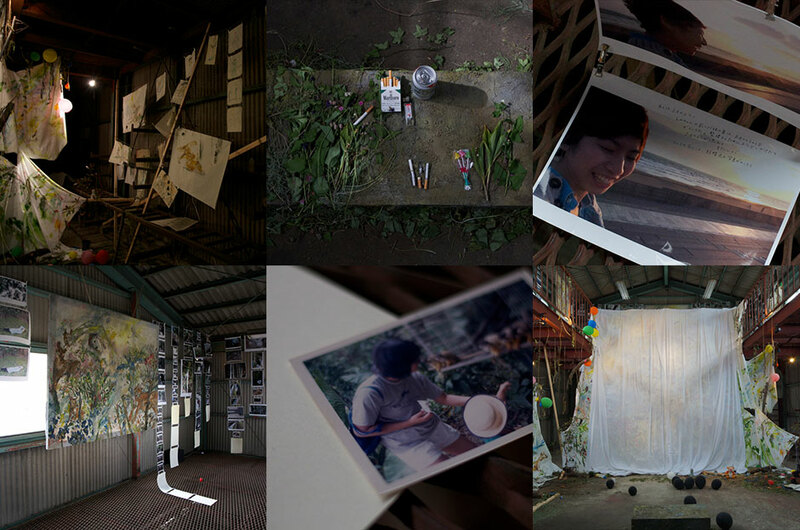 In the second part of the exhibition, all of the recordings; including the procedures that Hanazawa faced with the dead person during the funeral rites and the audiences involvement at the funeral site is shown on the video. Why do people believe in the necessity of proper “funeral rites”? That must be because people believe in the creativity (Musubi) of the funeral rites. Human ancestors conceived the tertiary idea that “the dead” do not return to nature directly after death, they do not die totally and pass through an intermediate process in which people are not ‘living things’ nor ‘inanimate objects’. The funeral rites ceremony begins to return the dead to nature and have a communication with something non-existent. Living people change their appearance in the course of exchange with the dead/non-existent. I can view the source of creativity through the magnificence of those changes. Living people are asking the dead, “What do you want me to do?” They are trying to listen to the dead as if the dead are sending out very slight signals and to deepen their awareness. Also people try to pick up on those signals to be able to recall the time had with them before death. When living people deepen their awareness, they certainly do not just see beautiful memories. It requires tremendous patience and psychological energy to franticly catch messages from the subconscious. When people communicate with the non-existent in the deepest part of their awareness without giving up seeking a reply, the mind and body will certainly be altered. After people have such an experience, they will revitalize dialogue with real people who actually do exist; who can talk, be touched and listened to. People continuously delve deep into the perception of art as well as funeral rites. People can understand the meaning of speech with a non-existent, and feel instinctively drawn to the creativity (Musubi) which connects the human mind to places, to reside in the course of the dialogue. Copyright © 2013 dokutsu.net. All Rights Reserved.